eave bangalore by 6am and reach maddur. you can have breakfast and leave for Sathyagalam via malavalli. Here also Bhattar stays inside the temple. You can take bath in cauvery which flows close to temple. After sathyagalam you can travel to Madhyarangam which is less than 5kms along the beautiful cauvery river. In Madhyarangam also Bhattar stays close to temple. After dharsan in Madhyarangam you can visit Gaganchukki and Bhaichukki falls both less than 3kms from Madhyarangam. 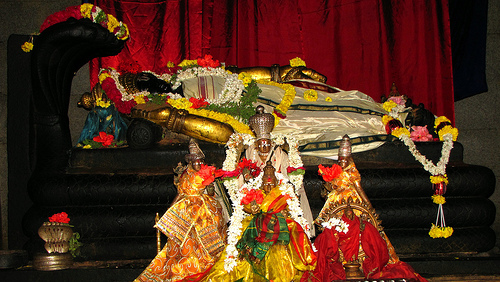 From Madhyarangam you can visit T.Narasipur Gunja narashimar temple via sathyagalam - Kollegal route. Bhattar stays close to the temple and this temple will be closed by 12.30pm so please ensure you cover sathyagalam/madhyarangam before 11am and leave for T.Narasipur. Cauvery flows very close to all these temples. From T.Narasipur you can reach mysore outer ring road and reach srirangapatna. You can have dharsan by 4pm and leave for Melkote via pandavapura. you can reach melkote by 5.30. you can have nice dharsan and return to Bangalore via mandya. If time permits you can also visit Maddur (ugra narasimhar and Beautful Varadarajar(16feet high)) and Channapatna(thotamalur temple). Both the temples are on the Mysore-Bangalore highway and it will not take much time. You can first visit Melkote and leave for T.Narasipur. T.Narasipur closes by 12.30pm and opens at 5.30pm only. Then you can visit Sathyagalam via kollegal and madhyarangam is less than 5 kms from here. Please write to me if you need more information.